“Taman Ayun” means beautiful garden. The temple is located in Mengwi village, about 1 hour drive from Denpasar. The temple was built in 1634 by the Mengwi Dynasty, the King of I Gusti Agung Anom. In the precincts, there are one temple for the worship Mengwi, and other one for the worship only God. The temple is called “Meru” which has layers of roof and it refers to Mount Agung. 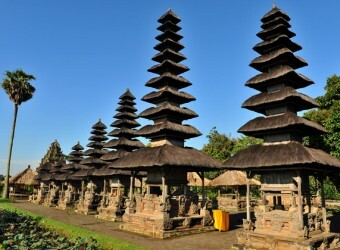 I visited many temples on my holiday in Bali, and I thought Taman Ayun Temple is a temple with fresh air. The visitors are not allowed to enter the temple complex, so I relaxed and enjoyed a walk around the pool, from here I could see the beautiful meru, very mystic. The temple name means” temple with beautiful garden”, so it is very beautiful as the name.